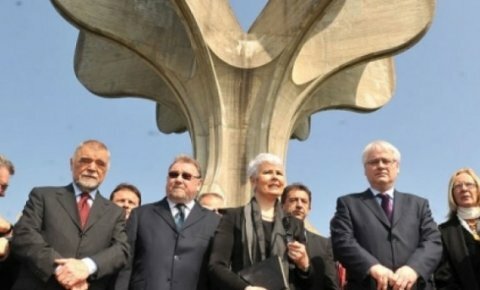 Image: Croatia’s president and prime minister, Ivo Josipovic and Jadranka Kosor, paying tribute to the victims of Croatian World War II fascism at Jasenovac last month, alongside former Croatian president Stjepan Mesic. Croatia’s new president Ivo Josipovic has in recent weeks made a series of apologies and expressions of regret for crimes carried out by Croats during the 1940s and 1990s. Last month, he apologised for Croatia’s role in the Bosnian war: ‘(The creators of) the 1990s policies…. based on the idea that division is the solution for Bosnia-Herzegovina, have sown an evil seed here, but also in their own countries’, Josipovic said in an address to the Bosnian parliament; referring to ‘the death and mutilation of hundreds of thousands and the expulsion of millions of people [and] destroyed economies and families’, he stated categorically, ‘I am deeply sorry that the Republic of Croatia has contributed to that with its policies in the 1990s. .. that the then Croatian policy has contributed to the suffering of people and divisions which still burden us today.’ He followed this up with a visit to the village of Ahmici, where Croat forces carried out a notorious massacre of Bosniak civilians in 1993. This apology was immediately condemned by the leadership of the ruling Croatian Democratic Union (HDZ); HDZ politicians such as Prime Minister Jadranka Kosor and party vice-president Andrija Hebrang disgraced themselves trying to justify the former Croatian policy. Josipovic went on to attend an event commemorating the sixty-fifth anniversary of an uprising at the Ustasha (Croatian fascist) death camp of Jasenovac in World War II, when he expressed regret for the crimes carried out by the Croatian fascists. Noting that history cannot be changed, he stated that it was not just the victories and successes that had to be accepted: ‘In every event, we must accept it also when it points to the evil that we committed against others. That can be a painful process; a process in which all those who wish our nation well must participate.’ He expressed his ‘deepest regret’ for everything that took place in Jasenovac and other Ustasha execution sites during the Second World War.’ At the time of writing, Josipovic has been visiting the Republika Srpska in Bosnia-Hercegovina, paying tribute to Serbs killed by Croat forces at the north Bosnian village of Sijekovac at the start of the war in 1992. Josipovic’s actions mark a courageous break with the usual practice of nationalist politicians, not only in the Balkans but also in Western Europe and the US, who seem to feel that it is incumbent upon them to defend ‘my country, right or wrong’. A readiness to acknowledge and apologise for the past crimes of one’s state or nation is something that places the principled patriot and democrat above the ‘patriotic’ hypocrite, who will complain endlessly about the crimes of other states or nations while defending those of their own. Such apologies form a necessary part of the reconciliation process between states that have previously been in conflict with one another, helping to cement a post-conflict democratic order. Nevertheless, the crimes which Josipovic has been acknowledging are not equivalent to one another; nor do they warrant the same kind of apology. In the case of the Croatian attempt to partition Bosnia in the 1990s and the resulting crimes, the issue is one of a state having the moral duty to apologise to another state and its citizens. The Republic of Croatia carried out military aggression against the neighbouring state of Bosnia-Hercegovina, one that involved atrocities against its civilian population. Although Josipovic personally was not responsible for that policy, he is head of the state that was responsible, therefore, it was his outright duty to apologise on the Republic of Croatia’s behalf to the state of Bosnia-Hercegovina and to its citizens. In the case of atrocities carried out by the Croatian Army, or by Croat militias supported by Croatia’s leadership, against Serb civilians during operations against the Serb rebels in Croatia and Bosnia in the 1990s, an apology from the Croatian president was also due. It is still the Croatian state that needs to apologise for its past actions, but in this instance, the apology is not owed to another state. The apology is due to the victims and to their relatives and friends, and to the Serb people in those areas, rather than to Serbia, whose citizens they were not. In the case of Croatian Serb civilians killed by Croatian forces, such as during the Medak Pocket operation in 1993 or Operation Storm in 1995, the apology is due to people who were Croatia’s own citizens – victims of the very state whose duty it was to protect them. Thus, the duty to apologise is similar to that acknowledged by Britain’s former prime minister Gordon Brown, when he apologised last year to the tens of thousands of British children forcibly sent to Commonwealth countries under child migrant programmes during the twentieth century, where they were widely exploited and abused. In the case of the Ustasha genocide of Serbs, Jews, Gypsies and others during World War II, an apology of a different kind is in order. Unlike the aforementioned Croatian crimes of the 1990s, in this case it was not the current Croatian state that was responsible. The Republic of Croatia is not the de jure or de facto successor state of the Ustasha-ruled ‘Independent State of Croatia’ (NDH), which was a puppet state established by the Axis powers on Yugoslav territory. The NDH was never recognised by the Allied powers, which viewed it for what it was: the expression that German and Italian rule took in that part of occupied Yugoslavia, equivalent to the General Government in Poland or to the Reichskommissariat Ukraine. According to the Nuremberg Military Tribunal established by the Allied powers after the war, ‘Whatever the form or the name given, the Croatian Government during the German wartime occupation was a satellite under the control of the occupying power. It dissolved as quickly after the withdrawal of the Germans as it had arisen upon their occupation. Under such circumstances, the acts of the Croatian Government were the acts of the occupation power… We are of the view that Croatia was at all times here involved an occupied country and that all acts performed by it were those for which the occupying power was responsible.’ (quoted in Jozo Tomasevich, War and Revolution in Yugoslavia, 1941-1945: Occupation and Collaboration, Stanford University Press, Stanford, 2001, pp. 271-272). The states with a duty to apologise for the crimes of the NDH are Germany and Italy. This was reaffirmed this month, when the European Court of Human Rights threw out the case brought by the Association of Second World War Camp Inmates of Republika Srpska against Croatia, for damages to the tune of 500 million euros for crimes carried out by the NDH. Sources suggested that this was because the judges concluded that Croatia was not the legal successor to the NDH, therefore not liable to pay damages for its crimes. Indeed, Croatia was the legal successor of Yugoslavia, and was established as a republic in the 1940s by the Partisans who destroyed the NDH. The Republic of Croatia is not liable to apologise for the NDH’s crimes, any more than the Spanish Republic would have been liable to apologise for Franco’s crimes, had it won the Spanish Civil War. Any more than the current Rwandan government is liable to apologise for the Rwandan genocide. By contrast, although the Ottoman Empire which perpetrated the Armenian genocide was overthrown by Mustafa Kemal’s Turkish nationalist movement, nevertheless Turkey is the legal successor of the Ottoman Empire, and the latter was not simply an insurgent faction or a party to a civil war, but a legally constituted state. As the successor to this state, Turkey does have a moral duty to apologise for the genocide. This does not mean that Josipovic was wrong to say what he did at the recent Jasenovac commemoration. He cannot – indeed did not – apologise on behalf of the Republic of Croatia, since that state was not responsible. He can however express regret in a different manner and capacity, as the democratically elected leader of the Croatian nation – the nation that produced the Ustashas. He cannot accept that the Croatian nation as a whole was guilty, but he can express regret for the fact that some members of his nation carried out those crimes; for the fact that the Croatian nation produced such monsters. Nations as a whole are not guilty for the crimes committed by some of their members, but nor can they pretend that these crimes have nothing to do with them. We could compare this with the case of an extended family, in which a wayward family member commits a crime. The head of the family might rightfully feel that the family’s honour requires an apology to the crime’s victims, even though neither the family as a whole nor its head can reasonably be blamed. Certainly, such chivalry goes down better than a callous refusal to apologise. We can compare Josipovic’s expression of regret with the opposition of certain Polish politicians, such as Michal Kaminski, to a Polish apology for the Jedwabne massacre of July 1941 in Nazi-occupied Poland, when Poles under the leadership of Jedwabne’s mayor Marian Karolak massacred the town’s Jews. The Jedwabne massacre was, albeit on a much smaller scale, similar in character to the Ustasha massacres of Serbs and others. Kaminski was undoubtedly correct when he pointed out that the whole Polish nation was not guilty of a massacre carried out by a particular group of Poles in a particular town at a particular time. But this ignores the fact that you do not have to be guilty of something in order to say sorry; nor does an apology imply an admission of guilt. The readiness of Polish president Aleksander Kwasniewski to apologise for the Jedwabne massacre suggests a much more mature sense of national responsibility than that of Kaminski. Another point of comparison is the declaration issued in March by the Serbian parliament condemning the Srebrenica massacre, which involved also an apology. The apology, less than a sentence long, was inserted at the end of a paragraph; it was made only to the relatives of the victims rather than to the people of Srebrenica or of Bosnia as a whole. It was an apology only that ‘everything possible had not been done to prevent the tragedy’, rather than for Serbia’s role in organising, arming and financing the Bosnian Serb forces that carried out the massacre, or for the Yugoslav Army’s collusion with these forces during the massacre. It avoided using the word genocide, albeit recognising this genocide in a roundabout way, by condemning the massacre ‘in the manner established by the ruling of the International Court of Justice’. And although it avoided condemning any of the other crimes carried out by Serbs during the war, it nevertheless included an ‘expectation that the highest authorities of other states on the territory of the former Yugoslavia would also condemn the crimes committed against the members of the Serbian people in this manner, as well as extend condolences and apologies to the families of the Serbian victims’. In fairness, such a grudging and mealy-mouthed declaration was probably the most that its authors could have pushed through parliament; even in this form, it barely scraped together enough votes to pass. But it does not suggest much genuine contrition on the part of Serbia’s lawmakers. Serbia can and has done better than this. On 15 June 2005, the Council of Ministers of the State Union of Serbia and Montenegro stated: ‘Those who committed the killings in Srebrenica, as well as those who ordered and organised that massacre represented neither Serbia nor Montenegro, but an undemocratic regime of terror and death, against whom the majority of citizens of Serbia and Montenegro put up the strongest resistance. Our condemnation of crimes in Srebrenica does not end with the direct perpetrators. We demand the criminal responsibility of all who committed war crimes, organised them or ordered them, and not only in Srebrenica. Criminals must not be heroes. Any protection of the war criminals, for whatever reason, is also a crime.’ In that year, the president of Serbia and Montenegro and the president of Republika Srpska attended the tenth anniversary commemoration of the Srebrenica massacre at Potocari. More recently, however, the Republika Srpska’s leadership has been regressing; Prime Minister Milorad Dodik has been engaging in revisionism and denial in relation to Srebrenica and to other Serb war-crimes. State apologies for past crimes will always be a sensitive manner; the politicians who make them will always be treading a fine line; the extent of an apology issued, and the reaction it receives at home, will reflect the degree of a nation’s democratic maturity. All the more reason to watch them closely; to interpret the degree of contrition that they actually represent, and to see who is for them, and who is opposed.